What can cause an automatic garage door to suddenly stop working? The answers to that questions are numerous, as there are many different malfunctions that can come to affect your door. Below you'll find a short explanation of the most common ones. This is perhaps the worst problem that can affect your system, but that doesn’t mean that it’s impossible to fix. When a garage door spring breaks, neither you nor your opener will be able to lift the door off the ground. You should never try to handle this type of scenario on your own, as these devices can be incredibly dangerous and may cause serious harm. It is easy to confirm that the spring broke - you simply need to look up and you'll probably be able to see what's left of it. Again, just because you can see the problem, doesn't mean you can repair it. If you try to handle it on your own, you can not only get hurt, but other parts of the system could be damaged in the process. There's also a high risk of the lift cables getting twisted around the rollers when you try to lift the door during this scenario. It is crucial to avoid making attempts for opening the door either with the opener or manually before the necessary spring replacement has been carried out. If there is grinding noise coming from the motor and the door doesn’t go up, then you probably have a broken main gear. This is the gear in charge of transferring power from the motor to the drive. It has to be replaced without delay. You can count on our team that specializes in professional motor repair. If the opener is completely silent, there are several possible explanations. The motor may not be getting power because of a problem with the electrical outlet or the wiring. It is possible for the motor to have failed, but this is highly unlikely. Circuit board failure is even less probable, albeit not impossible. In any case, replacing the faulty component will solve the problem, and our team will be happy to help. 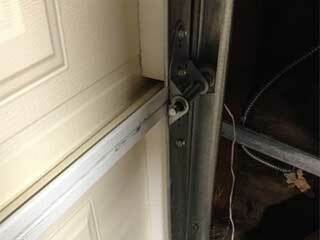 When this type of problem occurs, the door will get jammed and stay uneven. In some cases, the garage door can get off track too. This will make it completely stuck. The solution involves replacing the broken cable. If the other one is in good condition, there will be no need to replace it too, but since they were installed together, odds are their condition will be similar. If the door has gone off track, it will need to be properly adjusted. If you noticed the track is bent, it should be fixed or replaced depending on how bad the problem is. It is possible to prevent cables from breaking. You should take the time to inspect these components for fraying and cuts every so often, and get them replaced if you notice any of these signs. Our company works with the best brands available in Connecticut, so regardless of what part you need to have installed or replaced, you can rest assured that our products are of the highest quality.